The ISSF World Cup Stage 5 closed today at the Gabala Shooting Club with the men’s 50m Rifle 3 Positions final. After pocketing the Bronze medal five days ago in the men’s 10m Air Rifle, Hungary’s Istvan Peni qualified for his first final in this event, climbing to the highest step of the podium and pocketing the brightest medal. 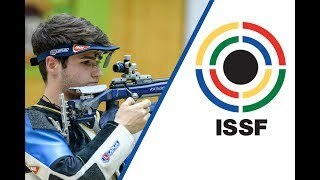 Nailing three outstanding prone position series, where he scored 52.1, 52.0 and 53.3 points, the Hungarian 20-year-old grabbed the lead of the match, and despite missing the 10th ring with four of his last five shots, he managed to maintain the top position and seal the Gold medal with 458.4 points. “It feels great, it’s been a great competition here in Gabala. I had pretty good scored in all three Rifle events, and finally won my first Gold medal, that I dedicate to my parents and my girlfriend who have always been very supportive all along my career,” he said. “The main goal of the season for me is the ISSF Junior World Championship. It’s my last season as a junior shooter and I want to be remarkable,” concluded Peni. After winning six World Cup Golds out of six podium placements, 28-year-old Hui Zicheng of the People’s Republic of China scored 457.4 and pocketed his first Silver in this event. The Bronze was delivered to Poland’s Tomasz Bartnik, who qualified for his second consecutive final after placing 8th in Munich (GER) a few weeks ago. The 27-year-old scored 444.4 points and secured the first international medal of his career. Switzerland Jan Lochbihler fired a bad 7.3-9.0 combination midway through his standing series, sliding out of the medal positions and eventually taking 4th place with 433.8 points. Croatia’s Petar Gorsa entered the final with the highest qualification score, finishing in 5th place after losing a tie-breaking shoot-off against Lochbihler. The Croatian 32-year-old, ranked 10th in the world, scored 424.8, preceding Kazakhstan’s Yuriy Yurkov, who took 6th place with 414.0. The first shooters to be eliminated from the final after shot number 40 was three-time World Cup medalist in this event Serhiy Kulish (24) of Ukraine, who placed 7th with 404.7 points, and India’s first-time finalist Satyendra Singh, who concluded in 8th position with 396.7. The 2017 ISSF Season will now move to Suhl (GER) for the ISSF Junior World Championship Rifle/Pistol, scheduled from June 22nd to June 29th. 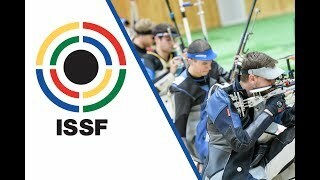 Also in Suhl, from the 22nd to the 26th of June, the ISSF Target Sprint World Championship will take place. Live results of the competitions, news and updates will be available on www.issf-sports.org and on all ISSF social media platforms: Facebook, Twitter, Instagram, YouTube, Weibo and Youku.